“What Are You Doing For the Rest of Your Life?” from Painted Lady (1980) with Archie Shepp, Hilton Ruiz, Jack Gregg, and Freddie Waits. Like many of Michel Legrand’s pretty collections of minor chords, this song became a standard immediately. It’s obviously “white” and “clean” in expression; after all, Legrand is proudly French. Lincoln and company make this near-bland tune wholly “black” and “raw.” The voice resonates from within a chasm, the band warps and woofs, and the overall affect is nowhere near irony but should not be taken entirely at face value, either. On the bridge when she claims, “I want to see your face in ev’ry kind of light/In fields of dawn and forests of the night,” the final “night” is not Legrand’s third but Lincoln’s tonic and sung like the dead center of the blues. Shepp and Waits sound really great as well. I’m not as sure about the arco bass passage but it’s certainly “raw!” Thanks to Karen Goldfeder for hipping me to this track many years ago. “The River” from Talking to the Sun (1983) with Steve Coleman, James Weidman, Billy Johnson, Mark Johnson and backup vocalists Bemshee Shirer, Naima Williams, and Arlene Knox. Lincoln became famous not just as a singer but as a poet. Here, “The River” is a metaphor for cars on the highway. What initially seems modest gathers force through Lincoln‘s wry delivery—half sung, half spoken-word—and the surprisingly detailed arrangement. While keeping the minor 12/8 steady, all the band members listen to the poem and take part in illustrative sound effects. It would be almost too obvious if it weren’t for the superb mini-chorus, who frequently drop in to harmonize with Lincoln in significant places. At one point Shirer, Williams, and Knox break off into chilling solo exhortations of “Money!”—a word that does not appear in the poem proper. Betty Carter was more celebrated for hiring and encouraging young musicians, but Abbey Lincoln did it too. Whenever I saw her live in the Nineties she was using strong 20-somethings who looked not just thrilled at the opportunity but also terrified of the responsibility. They knew they were accompanying not only a great musician but a significant participant in American cultural history. On Talking to the Sun she’s with the first generation of M-Base, all of whom revered her. When I was just a tyke I saw a quartet performance of James Moody with Harry Pickens, Todd Coolman, and Ed Soph at a Jamey Aebersold camp. I thought it was just sensational. Because of that gig I got his latest disc, the now rare Moving Forward. The overall production of the faux-soul vocal track “What Do You Do?” is a little dated now, but still, the man had serious power and phrasing. The day before Moody died in San Diego, I was in the same town and took a lesson with Charles McPherson. To demonstrate certain rhythmic and phrasing ideas, McPherson scatted beautifully. I wanted to tape a half-hour of Charles McPherson scatting in order to transcribe and study! Moody singing, McPherson scatting: although these men are associated with playing the most dextrous bebop lines on the saxophone, all those double-time passages are backed up by an elemental connection to the human voice. Lee Konitz has been teaching me about this too, and when I interviewed him Henry Threadgill admonished me not to play transcribed solos but to sing them. OK, OK! I’m getting the message. Sing. At any rate, while relistening to James Moody this morning I keep noticing his innate earthy lyricism. And, as I keep saying: as the last of the real bebop cats leave the planet, they are taking that mysterious music with them. When they are all gone, it is done. Treasure them now. 1. What is your favorite Milton Babbitt CD? Mine is Philomel, which features the gigantic 60s-era RCA synthesiser at Columbia-Princeton Electronic Center alongside relatively conventional performances. It’s a classic record which must be owned by all fans of experimental music. Nothing will surpass it within the context of its particular genre: this sound is permanently avant-garde. 2. After Babbitt died, I poured myself a small single malt, dimmed the lights, and listened to the complete disc all the way through with my eyes closed. It was easy to do. 3. When saluting Babbitt, one must also salute the core group of selfless virtuosos who performed him comfortably. On Philomel, the pianist on “Post-Partitions,” “Reflections,” and one version of “Phonemena” is Robert Miller. The vocalist on “Philomel” is Bethany Beardslee, and on both versions of “Phenomena” it is Lynne Webber. There were many others who became part of the “Babbitt family players,” especially the first person to record the complete piano music, Robert Taub. 4. When I was 20 or 21 I worked on the hefty Babbitt chamber piece “Whirled Series” with saxophonist Pat Zimmerli. It took us forever to learn, one gruelling bar at time, and I never played it well. Five years after getting through it/giving up, I bought the professional recording. After the first minute or so, it was utterly incomprehensible new music, like I’d never heard it before. This is pretty common, I believe: intellectual 20-year-olds begin by devoting themselves to getting inside Babbitt, then quit after realizing that their ears will never be good enough to hear the kaleidoscope in a satisfying fashion. 5. To understand Milton Babbitt’s music, you have to read his writing. His lecture “The Twelve-Tone Tradition” in Words About Music is highly recommended. Much of it is about Schoenberg: “He was a very honest man, a man desperately trying to write, in some sense, the greatest music ever. We all try to do that—most of us do, anyhow.” An early essay “The Composer as Specialist” (unfortunately retitled “Who Cares If You Listen?”) seems especially relevant in the internet era: with so little possibility of breaking through to a larger audience, it only makes sense to hunker down and write “the greatest music ever” for oneself and (possibly!) posterity. 7. Obits for Babbitt stress his generosity and love of living, for example the heartfelt remembrance by David Rakowski, “As Ever, Milton.” Babbitt was in the audience of many NYC new-music concerts I attended during the Nineties, even if his music was not on the program. At one of them I shyly went up and said, “I just got the score to ‘Three Compositions for Piano. '” Babbitt immediately gave me his phone number, and when I called him the next day he read off a few note corrections to the middle movement. 8. I gave up on “Three Compositions for Piano” after reading that ultra-heavyweight Charles Rosen considered it unplayable. And that wasn’t a snap judgement: he toured it with Roger Sessions as (incompetent) page turner. Still, Rosen regards Babbitt as one of his generation’s finest musicians. 9. “All Set” remains the definitive melding of jazz and serial music. I know the other examples! But “All Set” is it. For a while I played it for everybody I knew. It usually went over like a lead balloon, but one time a celebrated bassist/composer called me the next day. “Hey! What was the name of that twelve-tone piece again? I want to keep listening to it.” I’ve since realized how valuable “All Set” is at a practical level: whenever I’m confronted with some moderately obtuse college jazz composition that thinks it is really “out” or “advanced,” I can just say to the perpretator: “Have you studied ‘All Set’?” I grilled the original commissioner, Gunther Schuller, extensively about this unique work in our interview. 11. There’s a marvelous hour-long documentary by Robert Hilferty and Laura Karpman currently streamable online. In a few places Babbitt is shown playing what he called “cocktail piano.” (In Words About Music he brags about doing this “better than Schoenberg.”) My jaw is on floor. As much as I appreciated his integrity and his authenticity, at some point I wrote off Babbitt’s non-intellectual connection to music as relatively slight. Now I’m not so sure. What a shame we don’t have Milton Babbitt plays Cocktail Piano to file on the shelf next to Philomel. 12. There was only one. There were no “simultaneities” in this particular musical equation. Milton Byron Babbitt stands alone. He will never be popular. Nor will he cease to inspire. Blind pianists often have a special relationship to the instrument. Frequently the touch is softer and more refined. George Shearing had that sensuous kind of connection. In a slow unaccompanied ballad, Shearing touched the piano as sweetly as anyone ever has. That’s probably my favorite place to hear Shearing, in slow solo pieces that are almost “classical” in approach. The trio disc with Israel Crosby and Vernel Fournier, Jazz Moments, is a great record that many of my peers study chapter and verse. I like hearing the less swinging, almost “mood music” stuff with the quintet and other groups, too. But Shearing would be immortal if he had done nothing else but write “Conception,” one of the greatest bebop tunes. He could really play on those hard changes, too, as this video shows. Fledgling pianists since the early 50’s have learned from the “Interpretations” folios, where Shearing takes a chorus of a standard and puts them through the paces. I remember looking at his “Over the Rainbow” for the first time. In E-flat: Shearing harmonizes the first two tonic melody notes with A seventh-altered and D seventh-altered. (“Oh, right. That’s how it’s done.”) Cedar Walton mentions learning from those folios in our interview. R.I.P. Joe Morello, the man of the perfect one-handed Moeller roll and author of the most famous 5/4 drum solo in history. Paul Desmond is a musician’s favorite, but the other members of the the famous quartet—Brubeck, Morello, and Eugene Wright—are not. Like “Sing, Sing, Sing,” “Take Five” is not the deepest music but both pieces unquestionably give the drummer some. For at least ten years, during the tenure of the classic quartet, huge audiences everywhere waited with bated breath for a drum solo over an odd-meter vamp. If that’s not worth something I don’t know what is! Charlie Parker used a major seventh at the start of a blues progression more than once (“Blues for Alice”), and so did Bud Powell (“Dance of the Infidels”). But it is impossible to imagine a cocktail piano flourish before those serious bebop pieces. On “Blues Changes” the pretty atmosphere continues until a proper, non-cocktail blues shout in the final cadenza. The last lick is the pure blues scale, slickly spun down from the top of the piano to the bottom, a stock effect that back-announces the preceding choruses as a new kind of cool. “Are you hip enough to get this?” Bryant seems to be asking. Miles Davis got it: he had already recorded a version of “Changes” with Bryant on piano and an identical opening flourish. Toots Thielemans got it: his most famous song, “Bluesette,” is basically Bryant’s collection of alternative II/V’s moved up a fourth and placed in the even more sentimental context of a waltz. If Bryant had actually written a tune (beyond the opening flourish) on “Blues Changes” it would probably be as popular as “Bluesette.” But what intrigues Bryant is not a tune but the blend of pretty harmony and the blues. He is fascinated by how well these disparate genres go together. Since this fascination is not academic or intellectual in nature, it’s easy to underrate by those who are not folk musicians. If you are conversant with much more “advanced” harmony, Bryant may seem to be appreciating the obvious. It’s not obvious. Folk musicians often know deeper truths than intellectual musicians. Every chord on Ray Bryant Trio is treated like a well-known member of an important family. They have a regal bearing earned from hard-won experience. You try to play the opening chorus of “Blues Changes” and see well it goes! The ambience is earthy, subtle, and relaxed throughout Ray Bryant Trio. Before “Blues Changes” there are two C minor bluesy ballads, “Golden Earrings” and “Angel Eyes.” (On the latter Bryant occasionally plays the outrageous eleventh E-flat to A-flat with his left, a span unthinkable to pianists with normal-sized hands. ) Connections to the hippest kind of modern jazz community are confirmed with solid renditions of “Splittin’,” “Django,” and especially “Daahoud.” The latter features unusual hi-hat work from Specs Wright, another member of that fecund Philadelphia scene that also fostered the Bryant dynasty. Bassist Ike Issacs was Carmen McRae’s husband, and this trio was her backing band for a time. It’s an unpretentious and classic record that I should have known a long time ago. While Mike Kanan’s rave was recommendation enough to buy it, also in the back of my mind was the thought I should try to find and interview Ray Bryant. Even though I had never paid him sufficient attention, I knew that Bryant was one of the last of a generation that understood folk wisdom and advanced harmonic information in equal shares. We will always have the advanced harmonic information, but I worry about the distance we have come from folk wisdom. Sadly, Bryant died the day after my purchase. Bryant deals more exclusively with the folk side of things on another 1957 recording, “After Hours” on Dizzy Gillespie’s Sonny Side Up. The original recording of “After Hours” by the composer Avery Parrish with Erskine Hawkins was a huge hit and the progenitor of a kind of urban, glistening, and patient piano blues. Despite its fame, there has never been accurate sheet music to “After Hours” available. No classical pianist has ever been able to play it. To learn it requires extensive listening to the record—and, ideally, someone who can play it already to show you how parts of it go. You don’t have to come from the black community to acquire the right information, but it surely doesn’t hurt. Maybe Gillespie had it mind to cover “After Hours” and looked for the right musician; maybe Bryant suggested it himself in the studio when the leader wanted to play some slow blues. However it went down, the only way Dizzy Gillespie could have programmed “After Hours” on his record date is by hiring a pianist that knew it already. The bass part is not easy, either, but Tommy Bryant had probably been playing “After Hours” with his brother for years. Quibbles aside, it is fascinating to hear three major modern jazz horn soloists (Gillespie, Sonny Rollins, and Sonny Stitt) tackle this grits ‘n gravy vibe. Almost everyone in jazz recorded at least one slow funky blues in the mid-50s, and one can learn a lot about aesthetics by checking them out. My current favorite is Bud Powell’s darkly dissonant “Dry Soul,” which is like “After Hours” gone terribly awry. The style would reach its apotheosis in a new crop of funky organists: Jimmy Smith also recorded “After Hours” in 1957. For most serious modern jazz pianists, the slick slow blues would become an exotic special effect the same way boogie woogie was for stride pianists. But a few like Bryant, Oscar Peterson, Junior Mance, and Gene Harris would continue to use blues licks, tremolos, walking bass lines, and other vernacular tricks of the trade in almost any type of song. I don’t always approve of this. The video of “Billie’s Bounce” with Hal Dodson and Leroy Williams is obviously great. At the same time, I have usually rejected this many blues licks in a bebop composition. Why not play a funky head if you are going to funk out? But now Bryant’s gone and I miss him more than I expected. The authenticity of his approach was unquestionable. The way he plays those clichés on “Billie’s Bounce” is just so damn good. I don’t think you can learn to play this way today; I think this era is over. I can remember exactly the first time I heard Frank Foster’s music: I was in seventh grade and saw “Blues In Hoss’ Flat” played by the high school jazz band in the auditorium in Menomonie. Band director, Jim Borgaro; saxophone soloist, Sue Orfield. Thank you! The long 1998 interview with William Brower Jr. is a profound document. Foster was modest and self-aware. Before his [John Coltrane’s] first tour of duty with Miles, his style and my style were very similar. This is around 1954, I think, ’55. I remember hearing a recording of his and I remember remarking to myself, wow, he sounds a lot like me. Then he got with Miles and I with Basie, and our paths went in vastly different directions. Trying to fit with the Basie orchestra and being torn between the Lester Young approach, and the Buddy Tate, Don Byas approach, and really being in love with Sonny Stitt, I was all kind of messed up, while Trane, his direction was very definite and intense. Here I — while I’m trying to fit with this institution, long-standing institution, by veering back and forth between Prez and Don Byas and Buddy Tate, my style became diffused, whereas Trane was pinpointed in a certain direction. Then he left me in the lurch. Count Basie’s sleek and relatively conservative big band would go on to define most of Foster’s career. And Foster’s composing and arranging would go on to define much of Basie’s later career: “Blues in Hoss’ Flat” is a good example. I love Foster’s work with Basie, but I also like thinking about how he explored modernistic tenor when gigging with his cousin Elvin Jones. There are about a dozen records of Jones and Foster together. Heavy Sounds, Coalition, Genesis, The Prime Element, New Agenda, The Main Force, Time Capsule, Dear John C. (which includes a remake of A Love Supreme) and Live at the Village Vanguard Vol. 1 are under Elvin’s name; The Loud Minority and Well Water are under Foster’s. When Foster played with Elvin, he could sound quite a bit like Coltrane, especially in a modal context. Foster: It could be related, yes, but I’m not speaking in terms of sequence of phrases, of similar sounding phrases. 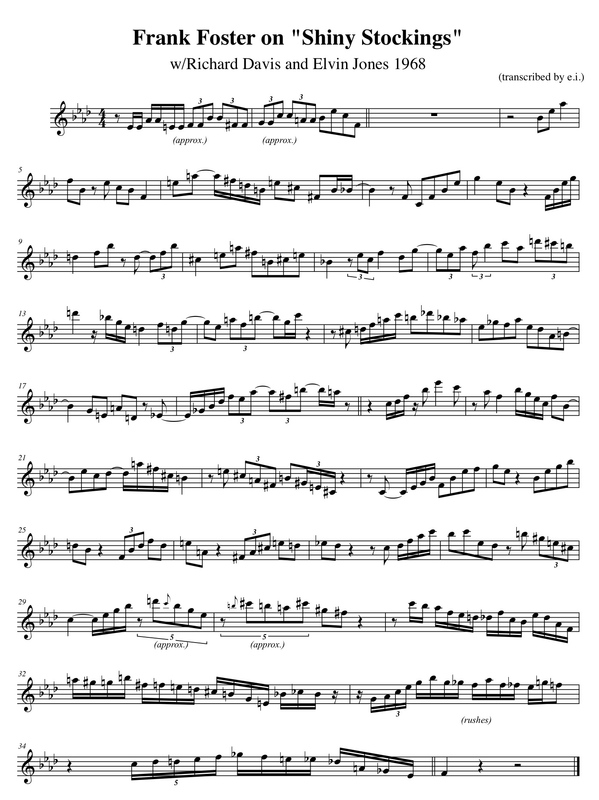 I’m just speaking of single phrases consisting of these flurries of notes that go from — especially from the lower register of the instrument to the higher register, to the extreme upper register, which were based on certain lines or modes or tonalities. I fell into this, because I fully understood what he was doing. I liked it, and it fit in with my concept. I used it and used it, but I realized that I was becoming one of a number of tenor saxophonists who were sounding like Coltrane. At the age of thirty-something, approaching the age of forty, I said, it’s too late in the day for me to be sounding like someone else, so I purposefully fought these Trane-like phrases and tried to really define myself as myself, but that was some kind of fight. Foster not only played the new modal music but wrote it. Well Water, from 1978 but discovered and reissued only recently, is a remarkable document of the era, featuring names like Bill Saxton, Mickey Tucker, and Charles Sullivan. Men who were in the front rank of working-class jazz musicians in the Seventies, men who could play swing, bebop, and modal with precision, men whose names would be more familiar now if there had been a more active social context for their music. Foster’s extensive liner notes are charming. It’s relatively unusual to hear Elvin Jones power a modern big band like the one on Well Water. With Elvin sometimes, we’d go so far out there that I couldn’t hear where one was. I would lose the one, but everything would be so exciting that I could just say, I’m going to pick a spot where I want one to be. I would say — way out there, I would say, right here, boom, that’s going to be my one, and it would end up that I was always right [laughs]. Here Foster is expressing sophistication, not naiveté. Probably Foster is talking about what could happen in a one-chord modal fantasia, but the larger issue of how the masters feel and relate to jazz time is relevant to any kind of context. It’s not just counting correctly. It’s about swinging no matter where you are putting your phrases or what the drummer is doing. When I transcribed Foster’s solo “Shiny Stockings” with Elvin Jones and Richard Davis, I was flummoxed trying to notate the opening two-bar break. What follows is only approximately correct. But Foster and Jones know something I don’t, for they land it right together before going into the chorus. Boom. Amazing Slow Downer reveals how loose older jazz is: at half-speed the flams between the three musicians are heart-stopping. But it is still so swinging because they have so much confidence and intention. Their collective beat breathes. Digging around in my collection I see that I have less Foster than I’d like. 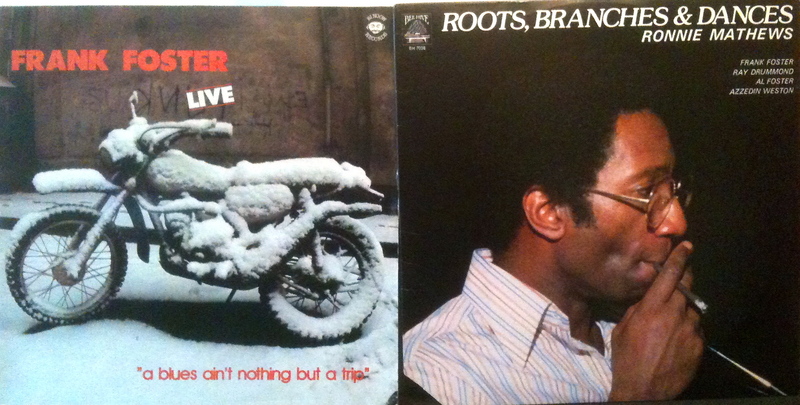 I’ve just been listening to a pair of obscure LPs. A Blues Ain’t Nothing but a Trip has a solid band with Ted Dunbar, Mickey Tucker, Earl May, and Billy Hart. The highlight is the minor blues waltz “Simone,” a Foster original that Elvin loved to play as well (it’s on Well Water). Foster also tears through “Giant Steps.” I’m not sure if that Euro-conceptual cover is cool or awful. Foster has a strong showing on Ronnie Mathews’s Roots, Branches, and Dances. Unfortunately, my copy is a little warped, so I’ve never really heard the first tune on each side. The double-shot of “It Don’t Mean a Thing” and “Hi-Fly” on Side A is really pretty great, though: Ray Drummond and Al Foster are two of the finest, and the leader is in his proper element. This is a good starting place to consider Foster as a burning tenor man who can sit alongside Johnny Griffin and George Coleman. Both albums are from the same era as Well Water. These aren’t the best produced or engineered jazz albums you’ll ever hear, but collectively they make a strong argument about the vitality of straight-ahead music in the late Seventies. When you want to talk about avant-garde, you’re talking about; Albert Ayler, Pharoah Sanders, or one phase of Archie Shepp, and Ornette Coleman, Don Cherry, Anthony Braxton, or people like that, the Chicago Art Ensemble, Joseph Jarman, and those people. I think of some of these folks as authentic avant-garde players. I didn’t consider myself authentically avant-garde, just like I wouldn’t consider myself an authentic Dixieland player. I play to much bebop to be convincing as a Dixieland player. That’s all true. Still, consider: Foster shared the bandstand with Billie Holiday and Lester Young during their last guest appearances with Count Basie. His hit tune “Shiny Stockings” was recorded by older musicians like Teddy Wilson, Earl Hines, and Benny Carter. He played the most ferocious modal music with Elvin Jones. He shone as a big-band arranger but his powerful tenor was always at the ready. If you were going to try to pick one jazz musician who had the most authentic and intellectual knowledge of diverse jazz styles but never let that knowledge get in the way of a natural blues sensibility, you could do worse than pick Frank Foster.